I’ve been having fun with sprouts recently. After a highly successful attempt at growing Chinese bean sprouts (from mung beans), I decided to try my hand at something a little more exotic. Soak a tablespoon of seeds in lukewarm water overnight. The next morning, place them in a large jam jar half filled with water. Swill the seeds around a bit to rinse them and place a square of muslin or cheesecloth around the mouth of the jar, securing with an elastic band. Tip out the water through the muslin. Place the jar on its side (for good air flow) in a warm, dark place. Rinse and repeat once or twice a day for 4-7 days until you have beautiful sprouts. When the leaves start to appear, position the jar somewhere sunny to ‘green’ them. I used mine to make a pickle (inspired by this: http://www.nandyala.org/mahanandi/archives/2007/10/04/fenugreek-seeds-methi-menthulu/). I made a tarka by adding 1/2 tsp mustard seeds and pinches of asafoetida, turmeric and salt to hot oil. 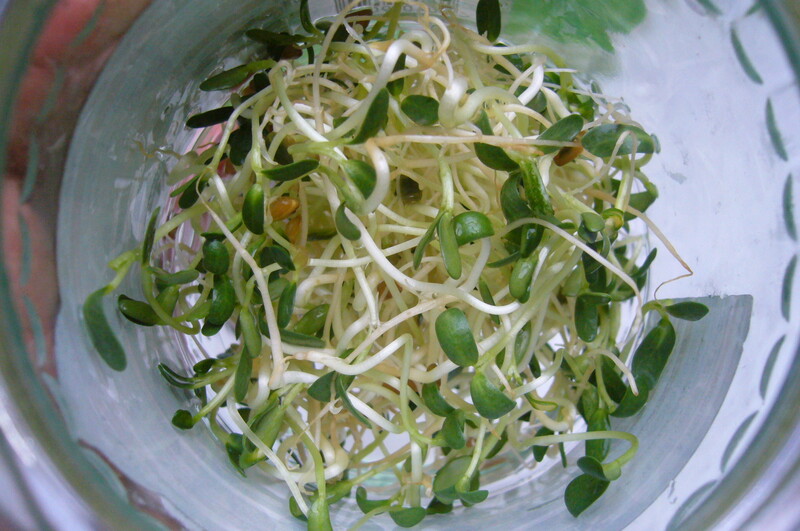 When the seeds started to pop, I added some green chilli slices, lemon juice and the sprouts, stirring quickly to mix. Et voila! It’s all ready to eat, spicy and bitter and sweet all at the same time! 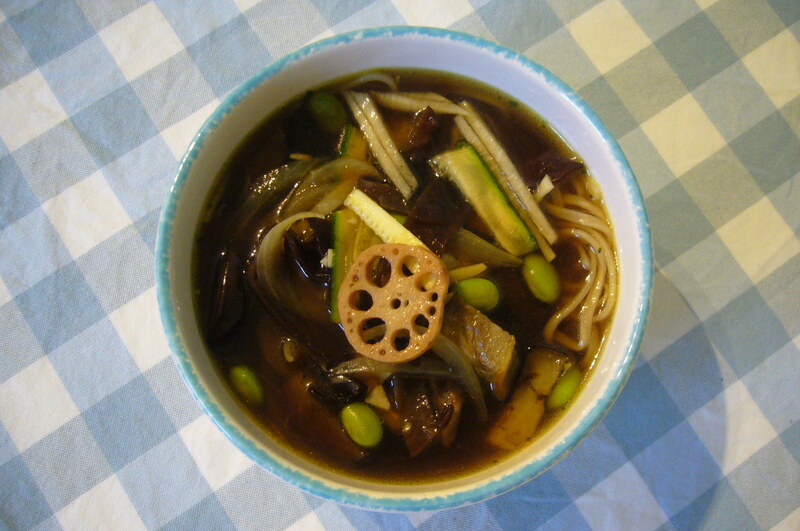 This broth is a good store-cupboard dinner, especially if you’re like me and always have a treasure trove of Asian foodstuffs in the kitchen cupboard. It’s simple yet satisfying and doesn’t really take too long. Soak the mushrooms in boiling water for at least 40 minutes. I like to put them in a mug with a teaspoon resting on them to keep them submerged. Make sure you keep the soaking liquor as this will give the soup that yummy round mushroomy flavour! Meanwhile, roast the aubergine in 1 tbsp oil for around half an hour, or until browned and fairly soft. Fry the onion and sugar for a few minutes, then add the garlic. Fry for another minute or so before adding the ginger, lotus root and edamame. Slice up the mushrooms and add them too. Pour in the stock and the mushroom soaking liquor, along with the soy sauce and fish sauce. Chuck in the mooli, courgette and aubergine, and let simmer for a minute or so. Serve on top of noodles in a nice round bowl and tuck in. Slurp, smack your lips and say ‘mmm’. according to what was in the fridge. mins or so. While they are becoming one of the most delicious things on this earth, mince the onion, garlic, celery and ginger. In a separate bowl, mix together the soy sauce, brown sugar, tomato paste, vinegar and cornstarch for a sauce. 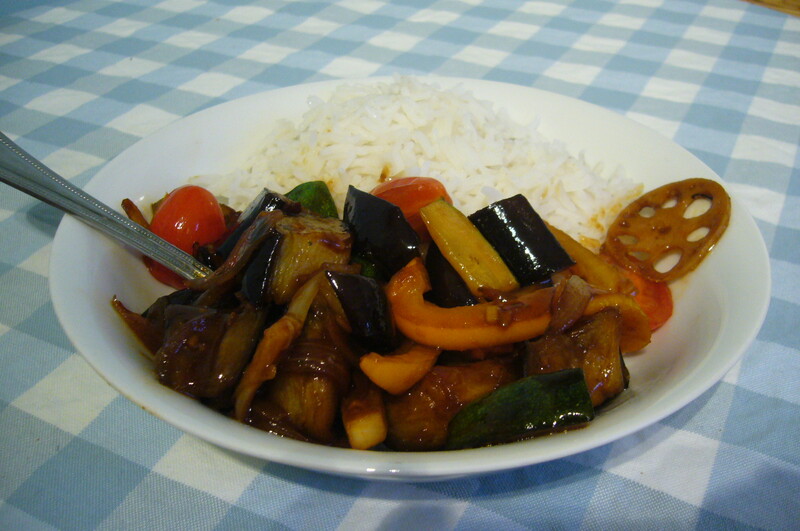 Using the sesame oil, fry up the minced veggies with the chilli for a couple of minutes until lightly browning. Add the stock, then the sauce. Throw in the aubergine. Toss, serve with rice, and garnish! Ta-da!